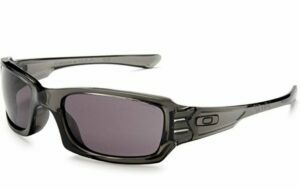 This entry was posted in Hiking Accessories and tagged backpacking gear hiking gear julbo Maui Jim mountaineering gear oakley photochromic lenses Serengeti smith on January 18, 2019 by Laura P.
Overexposure to sun light is not only harmful for your skin, but also for your eyes. Spending a long day out in the sun without sunglasses will cause most to have tired or slightly burning eyes – and the sun can indeed burn the eyeball and be a contributing factor to various eye issues such as cataracts. For hikers and mountaineers, it is also important to note that the potency of UV rays is enhanced by 4% for every 305 meters increase in altitude, which makes proper sun protection of the eyes a legitimate concern. 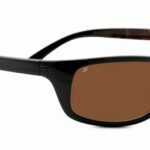 Below we have made a list of the best hiking sunglasses for men, but as most sunglasses are unisex in their design you might also want to check out our list of the Best Hiking Sunglasses for Women where most pairs can be worn by both genders. In the following you can read more about some of our selection criteria. 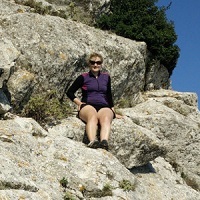 The most important feature of hiking sunglasses is actually not the lenses, but the shape of the frame and sidepieces. The lenses are of course also very important, but as sun does not just come from one direction, it is crucial that the frames are shaped in a manner that protects your eyes from all directions; either the sunglasses should wrap all around to your temples or the sidepieces should be wide enough to block out most of the sun rays coming from the side. All lenses for hiking sunglasses should protect against 99% or 100% of all UV radiation – note that some manufacturers (especially European) label their sunglasses with “UV400” or “UV absorption up to 400nm” – which means that they block out 100% of UV radiation. Another aspect of sunglass lenses is how much visible light they let through; there are five categories of Visible Light Transmission (VLT) 0-4. Category 2 sunglasses are the most common and can be used for most purposes, but for hiking and mountaineering in open mountain ranges etc. we would recommend category 3 lenses which block out 80%-90% of the visible light. Category 4 lenses block out more than 90% of the visible light and are thus meant for activities in very bright conditions, such as glacier walking or high altitude hiking, but cannot be used safely for driving at any time of day as they are too dark. 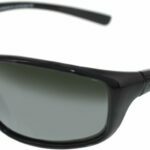 Polarized lenses: Polarized lenses are simply coated with a special chemical film that helps to reduce glare from the sun’s reflection off water or other shimmering surfaces (snow, grass etc.). The chemical filter absorbs horizontal light waves but still allows vertical light waves to pass through. While polarized lenses help you to see objects more clearly, they are not a must. 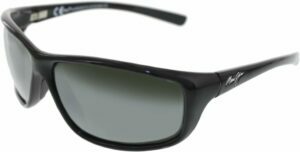 Several of the sunglasses in the selection below have polarized lenses. Photochromic lenses: Photochromic lenses, also referred to as transition or light adaptable lenses, darken automatically when exposed to sunlight (UV radiation) due to UV-sensitive molecules such as silver chloride or other silver halides being incorporated in the lenses – which themselves can be made of glass, polycarbonate or plastic. Photochromic lenses take less than a minute to darken and somewhat longer to clear up. The reaction time is usually considered to be the greatest disadvantage of photochromic lenses and can diminish the otherwise pleasant idea to have a pair of sunglasses which adapt to the light conditions. Some of the models below come with photochromic lenses (optionally). 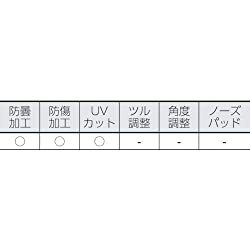 Eye size (width of lenses) 2.4 in. 2.1 in. 2.4 in. 2.6 in. 2.5 in. Bridge size (width between the lenses) 0.43 in. 0.79 in. 0.67 in. 0.63 in. 0.63 in. Temple size (arm piece length) 5.2 in. 5.2 in. 4.9 in. 4.9 in. 4.9 in. 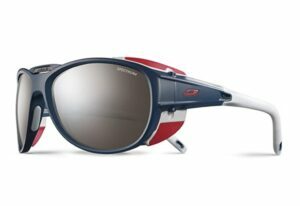 Julbo Explorer 2.0 is a pair of sunglasses meant for exploring the highest and brightest peaks. The sun glasses are designed for more extreme conditions with category 4 lenses, 360° adjustable temples and superior coverage of your eyes – not least due to the removable side shields. 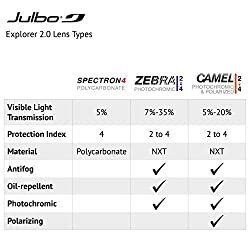 In terms of lenses, there are three options for the Julbo Explorer: The AltiArc4 mineral lens of exceptional optical quality and shock/scratch-resistance; the Spectron4 polycarbonate lens with flash finish and AR coating (also available as prescription lens) and the Reactiv lens – available either as the Zebra2-4 photochromic lens or the Chameleon2-4 photochromic and polarized lens. The latter is ideal for extreme visual conditions in the desert, high mountains and on the sea while Zebra photochromic lens is more all-around and also faster in adjusting itself to the varying light conditions. Although both the photochromic lenses can adjust themselves to let more visible light through (Zebra 35%, Chameleon 20%) corresponding to category 2-3 lenses, they should not be used for driving as all other category 4 glasses. Fives Squared is one of Oakley’s bestselling sunglasses and there is a reason for that. The sunglasses have smaller lenses than some of the other models included in this selection, but wrap comfortably around your face to ensure that your eyes are protected from all angles. The frames of the Oakley Fives Squared come in various neutral colors and ditto lenses which are also available in polarized versions. A really great feature of Fives Squared model is that you can buy replaceable lenses to customize them to different needs and adventures (for instructions, see video below). Among the replaceable non-polarized lenses there are nine different colors to choose from, while there are five colors of polarized lenses. All Oakley lenses meet or exceed the testing standards of the American National Standards Institute when it comes to optical clarity and impact resistance. 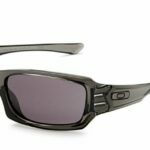 Smith Optics is behind some of the most attractive sunglasses for outdoorspeople and the Smith Frontman sunglasses are no exception. The frames come in black, brown, grey and cameo but there are even more options when it comes to lenses. 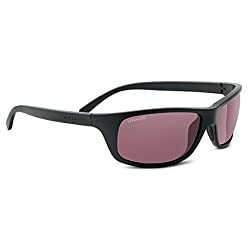 These include polarized lenses in the colors grey, brown and platinum, but also polarized lenses with Smith’s ChromaPop technology which makes colors appear clearer as it reduces color confusion (see more in the video below). 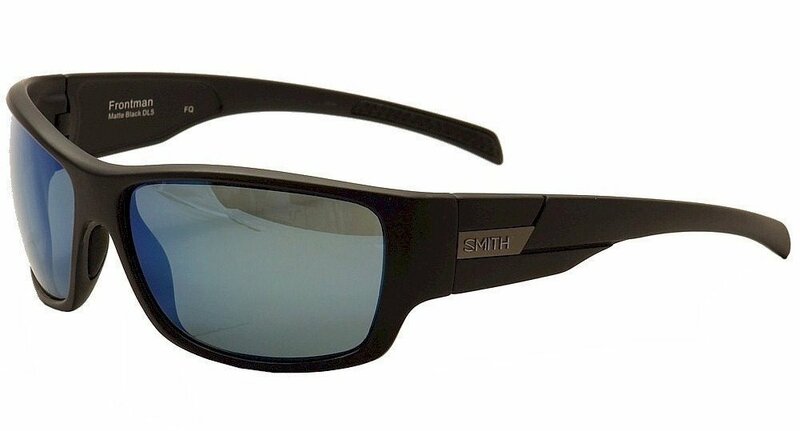 The Smith Frontman sunglasses are also available in the Elite Tactical version with MilSpec Ballistic Protection that meets ANSI Z87.1 and MIL-PRF-31013 standard. Serengeti Eyewear has set itself apart by including photo chromic lenses in all their sunglasses. The Serengeti Bormio model is a part of the brand’s Sport division where functionality and style go hand in hand. 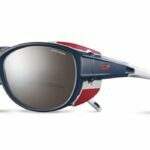 The Bormio sunglasses have relatively slim sidepieces but as the frame has a base curve of eight, they will wrap around the eye area flawlessly and protect your eyes from every angle. The frames are available in variations of black and tortoise and all come with Serengeti’s photochromic Polar PhD lenses. In the world of eyewear glass lenses are still the most optically clear lenses available, but the Polar PhD lenses were developed to imitate this clarity and come very close. For the uninitiated, Maui Jim might sound more like the name of a good cocktail bar but the brand was actually incepted in 1980 to create sun protective eye wear that would do justice to the splendid colors of the Hawaiian nature rather than impair them. For the same reason, all Maui Jim sun glasses have Polarized Plus2 lenses not to let glare disturb your vision and are made of actual glass (unrivalled optical clarity) rather than polycarbonate or plastic. However, it is not just any type of glass Maui Jim utilizes, but SuperThin Glass which is 20% lighter and thinner than standard glass while offering supreme scratch and solvent resistance. 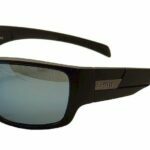 For this list, we chose the Maui Jim Spartan Reef sunglasses as the base curve 8 frame provides all-around protection of your eyes as well as good fit and comfort. 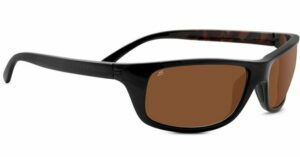 The frames come in five colors; Gloss Black with grey lenses, Marlin, Redfish and Matte Tortoise Rubber with bronze High Contrast lenses and Mahimahi with Maui HT lenses. The latter are merely VLT-category 2 glasses as they let 25% of the visible light through and might thus not be suitable for hiking in very bright conditions.